Do you, or someone you know, struggle with acne? Curious to learn more about why pimples occur, and how to prevent them? Here are the answers you’ve been looking for! Acne Vulgaris, what most of us just call acne, is a chronic skin condition that affects nearly 85% of Americans at some point in their lives. Acne forms when our pores become clogged with dead skin cells, sebum and bacteria. Why do we get acne?! All of our pores contain a hair follicle and a sebaceous gland, which produces sebum, our skin’s natural oil. The body is constantly regenerating and shedding dead cells, but when those dead skin cells get trapped within the sebum of our skin, they combine to create noninflammatory acne. These are those black and white bumps on your skin — otherwise known as blackheads and whiteheads. If bacteria is present on the skin, it can combine with the dead cells and oil and cause an infection, otherwise known as inflammatory acne. 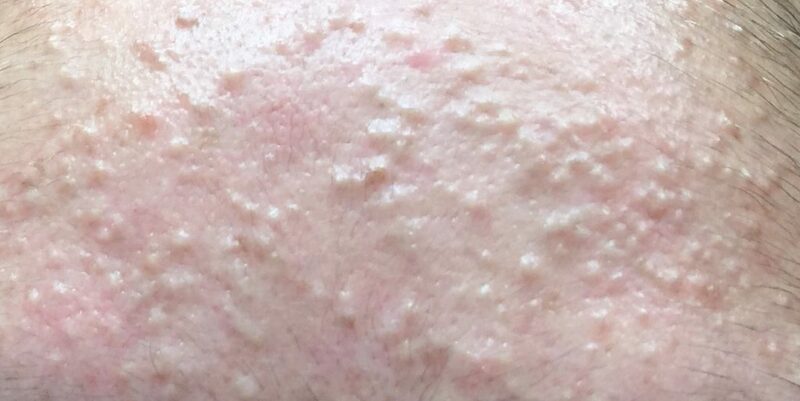 This type of acne, also called comedones, are simply clogged pores. You probably know them as blackheads and whiteheads, maybe even as the building blocks of acne. 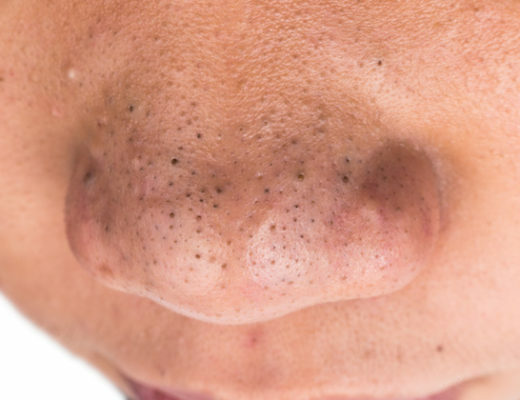 A blackhead is an open comedo, meaning that the clogged pore is open to the surface of the skin, and the air has oxidized the gunk inside, turning it black. A whitehead is a closed comedo, meaning the dead skin and sebum are unexposed but trapped within the skin. Propionibacterium Acnes, or P. Acnes for short, is a bacteria that loves to feed on the sebum within our skin. 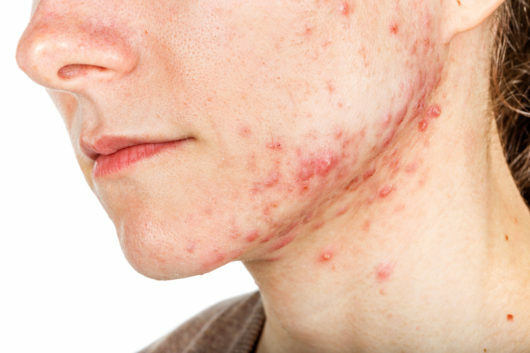 When P. Acnes bacteria gets into clogged pores it reproduces rapidly, causing inflammation. Then your body realizes something is awry, and rushes blood to the scene — causing even more redness and inflammation. Papules and pustules are the main types of inflammatory acne. Papules are red and hard, and pustules usually have a white head that’s surrounded by red, irritated skin. The most severe type of acne, however, is cystic acne, which includes nodules and cysts. Cystic acne forms deep under the skin, and is large, red, and painful. 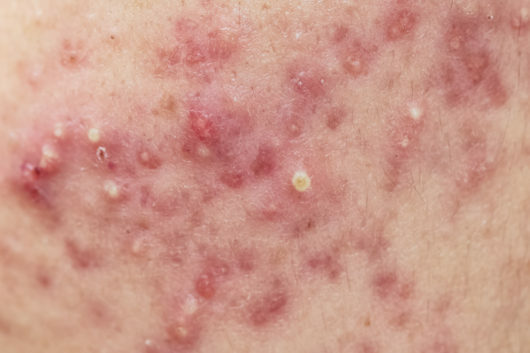 This is the type of acne that worries dermatologists most, as it has the highest chances of causing permanent scarring. It’s also the main type of hormonal acne, which is caused by a imbalance of hormones, thanks to your genetics. Hormones. Acne is common in teenagers and pregnant women because of the fluctuating hormones present in their bodies. Genetics. Those with a family history of acne are more prone to breakouts. Environment. City air that’s filled with pollution can wreak havoc on the skin. A slew of other factors, ranging from medications to dietary choices to oily cosmetic products, can also lead to acne. Constant friction on the skin, from clothing or sports equipment, will often cause breakouts, and consistent contact with dirty hands, sheets or towels can also lead to pimples. There are lots of ways to treat different types of acne — at home or at a dermatologist’s office. If you have blackheads and whiteheads, the key is to work to unclog your pores and prevent bacteria from infiltrating them. Salicylic acid is great for this, as it’s an antibacterial that reaches deep into pores, is oil soluble (meaning it’s perfect for oily skin), and helps to calm redness. Looking for a great salicylic acid face wash? Try the SLMD Salicylic Acid Cleanser. Noninflammatory acne is typically responsive to tretinoin, which is available only by prescription. Retinol is a less potent form of tretinoin that can be found over the counter. You should only apply tretinoin or retinol at night because these medications are deactivated by the sun and make skin more sensitive to the sun’s UVA and UVB rays. If you have red pimples and pustules that means bacteria is involved, and this is when a dermatologist might recommend using topical antibiotics, which help to kill the bacteria on the surface of your skin. They might also prescribe oral antibiotics, which tackle bacteria from the inside out. Look for ingredients like salicylic acid, benzoyl peroxide, akne-mycin, doxycycline, or clindamycin in products to help treat your pimples and pustules. Looking for good acne-fighting daytime and nighttime treatments? 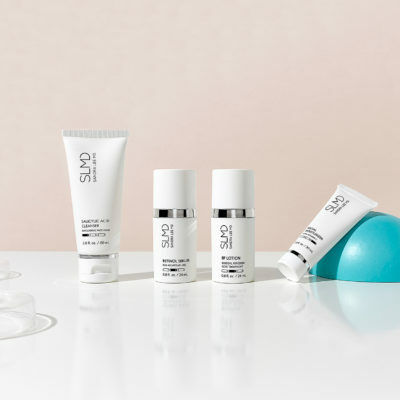 Try the retinol-based SLMD Retinol Serum and the benzoyl peroxide-based SLMD BP Lotion. Have sensitive skin? Sulfur is another ingredient that is a gentler acne treatment. Try it in the SLMD Blemish Cream! When people have a severe form of acne or cystic lesions, doctors may consider using a treatment called Isotretinoin (more commonly known as Accutane). Because Accutane is such a strong medication, there is some controversy around it, but it can be powerful for severe acne, it just needs to be monitored very closely by your physician. There are many procedures that can be done in a doctor’s office to help combat your acne. Estheticians are able to perform facials or comedone extractions which can help clear up your skin. Many dermatologists will offer cortisone injections, which will help to significantly decrease inflammation. Heavier, more concentrated chemical peels are also an option for those with severe acne. Dermatologists can prescribe oral and topical medications, and can help put you on a skincare regimen that will likely help to clear up your breakouts. What are your thoughts on azelaic acid for inflammatory acne?